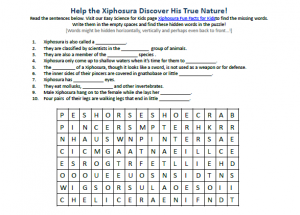 Xiphosura Worksheet – Download our fun and FREE science kids worksheets for parents and teachers. Our free to download Horseshoe Crab Xiphosura facts worksheet for kids has a fun word search puzzle and hidden words game. You can download our fun facts about Xiphosura worksheet and print it as many times as you need, at no cost. Our FREE Xiphosura Horseshoe Crab worksheet is perfect for Elementary school kids in Grades one to five, as well as for kids in Kindergarten and kids in Pre-K. This is an easy science activity for kids, aimed at improving the mind of your kids. They will better remember the facts they read about the Xiphosura and enhance their reading comprehension skills. The printable science worksheet for kids all about the Xiphosura or Horseshoe Crab is a fun way to capture your child’s interest and attention during after-school lessons or homeschooling activities. Make learning about science and animals fun with our free hidden words puzzles! Kids doing science enrichment lessons can enjoy learning all about the Xiphosura Horseshoe Crabs by doing our free and fun word search game for kids, included in this printable worksheet. Kids in Grade school from Grades 1 to 5 can enjoy our Xiphosura fun facts worksheet as a reading comprehension tool. Your kids will learn much about Xiphosuras, the Horseshoe Crabs, because they will re-read our fun facts about the Xiphosura several times to find what are the hidden words. Kids in Kindergarten and Pre-K who cannot yet read or write, can use our free easy science worksheet on Xiphosura as an educational listening comprehension activity. Educators can read to the kids the Horseshoe Crab Xiphosura fun facts and ask the kids to recall the missing hidden words. Children can also enjoy doing our easy science worksheet for kids while learning to search and recognize the hidden words. Parents can use our free downloadable science worksheet to make learning science fun and interesting for their kids and to spend quality time teaching their kids fun facts about animals. Teachers can use our downloadable worksheets for kids about the Xiphosura for their science lessons and to make learning about the Xiphosura Horseshoe Crab an enjoyable experience for kids. Educators and tutors can use our fun facts about Xiphosura worksheet for science enrichment classes and extra-curriculum learning programs. Our easy science for kids website is science made easy for kids. We offer many fun and free to use and download word search puzzles and free science worksheet printables for teachers and educators. You can even use our free Xiphosura worksheet along with our fun interactive Xiphosura Quiz as a reading comprehension kids activity. The Xiphosura or Horseshoe Crab is called a “living fossil”. It has hardly changed at all in the past 200 million years and is just about the only Arachnid that lives in the sea. Horseshoe crabs have four eyes and ten legs. Do you know why Horseshoe Crabs are considered as Arachnids? Learn more science facts about the Xiphosura Horseshoe Crab by downloading the free Xiphosura worksheet! Enjoyed the Easy Science for Kids Xiphosura Horseshoe Crab Worksheet? For lengthy info click here. Declan, Tobin. " Horseshoe Crab Xiphosura Worksheet - FREE Downloadable Easy Science Worksheets for Kids - ." Easy Science for Kids, Apr 2019. Web. 23 Apr 2019. < https://easyscienceforkids.com/horseshoe-crab-xiphosura-worksheet-free-downloadable-easy-science-worksheets-for-kids/ >.